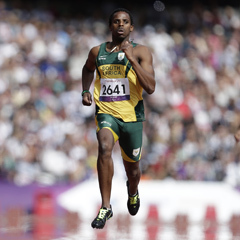 London - Capetonian Jonathan Ntutu set a South African record in his 200m T13 heat on Thursday at the London Paralympic Games, storming home in 22.40 seconds. Visually-impaired Ntutu said he intended to savour the moment while saving enough energy for Friday’s final. "I had a plan to conserve enough energy for the final tomorrow and just enjoy the moment." After his elaborate gestures on the podium when he won the bronze medal in the men’s 100m T13, the charismatic Ntutu said he was not sure what he would do if he won another medal. "A different one for tomorrow, but something to entertain everyone," he said of his haka-like celebrations on Saturday. "I didn’t plan that one, but tomorrow’s will be planned. I’ll be on that podium. It just depends who will be next to me." He faces tough competition though, after Jason Smyth from Ireland won his heat in 21.48 and Russian Alexander Zverev (22.18) and Luis Felipe Gutierrez of Cuba (22.35) qualified ahead of him in the other two heats. Samkelo Radebe, possibly distracted by his gold medal which he won as part of the 4x100m relay team, finished a disappointing sixth in his 100m T46 heat. He clocked 11.53 while Brazilian Yohansson Nascimento was the fastest qualifier in 10.94. Natalie du Toit was back in her comfort zone, setting the pace in the women’s 200m individual medley. Almost two seconds faster than her nearest rival, Du Toit touched in 2:36.92. Her team-mate Emily Gray missed the cut in 2:54.03. There was further disappointment in the pool as both Kevin Paul and Achmat Hassiem failed to progress through to the men’s 100m freestyle S10 final. Paul’s time of 55.55 was an African record, but was well short of the fastest swimmer, Andrew Pasterfield of Australia, who completed his heat in 53.01. Hassiem trailed in 57.61. Shireen Sapiro set another African record in her 100m freestyle S10 heat, with a time of 1:07.42, but again it was not good enough to qualify for the final. Her rival Sophie Pascoe from New Zealand swam the quickest race in 1:01.17.